In the hectic world of non league football, there are dozens of stories emerging everyday, so many that it can be hard to keep up with them all. Which is where our new Flipboard magazine comes into play. Called News From Non League, the aim is to update the magazine at least once a day, and gather some of the stories together in one place. If you’re not aware, Flipboard is a free app for Android and iOS devices that allows users to create their own “magazine” and include stories from any website, on any subject. In our case, this app will make it easier for us to get all the news out there, without having to worry about being able to write about it as it happens. The app is free to download, as mentioned earlier, and it would be great if you got involved by subscribing to the magazine, and maybe create your own! 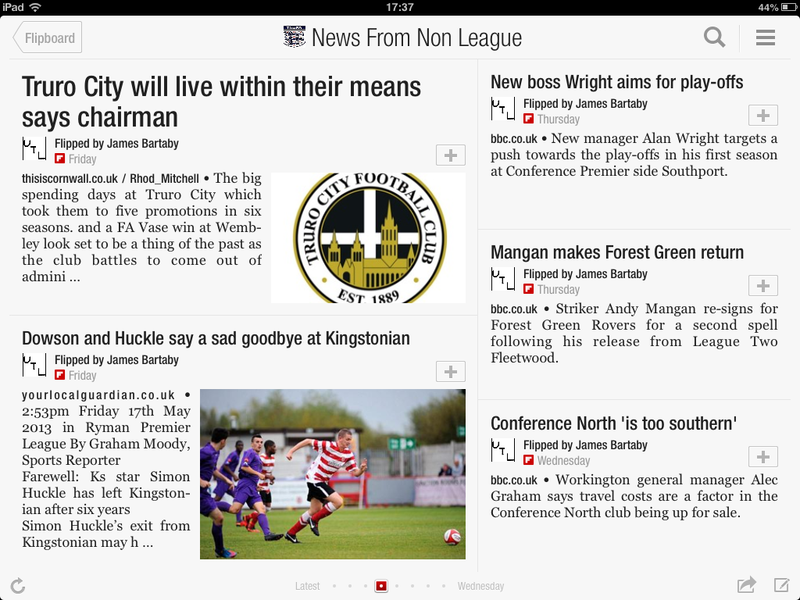 To find the magazine in the app, just search for News From Non League. Posted on June 5, 2013, in UTL Archive and tagged Flipboard, Non-League. Bookmark the permalink. Leave a comment.